Le Mans was not good for Aleix Espargaro. After had a double crashed on the practice session, Aleix Espargaro suffered the misfortune on Le Mans race. 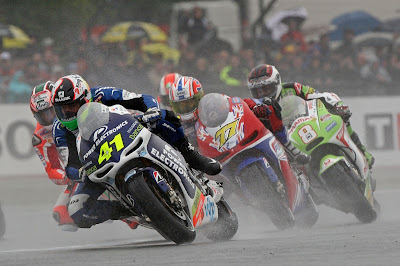 Aleix Espargaro said, "This weekend was a disaster, passed all the worst imaginable. In the morning, in the warm up with water, I felt good, but then the race was not comfortable. I had no gas and skidded back a lot. We ran very slow, we finished very far, but at least it's over this weekend, and I think positive and, facing the Catalunya GP." Aleix Espargaro had to lose best CRT rider, that has been acquired on last two race on Jerez and Estoril. Best CRT on Le Mans went to PBM rider, James Ellison.